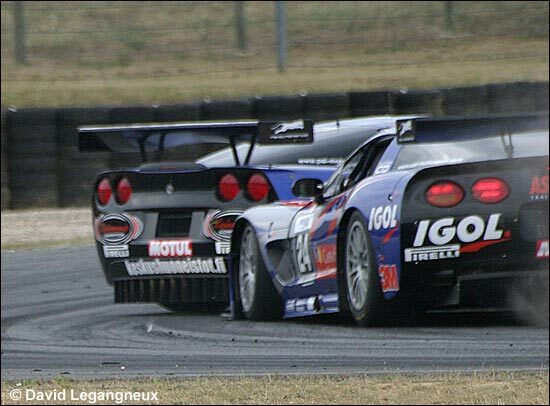 In the qualifying session for race one, the Corvettes outpaced their rivals. 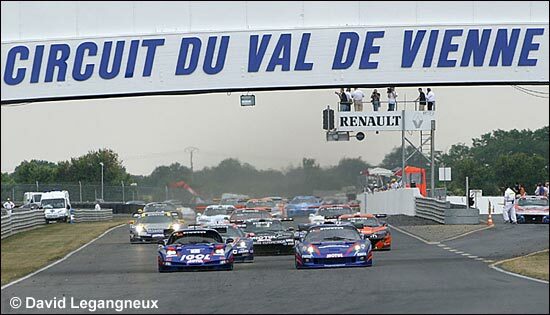 David Hallyday (PSI Experience C5-R) claimed his first pole position in the season, ahead of his teammate Pertti Kuismanen (PSI C6.R), while Yvan Lebon (SRT C5-R) was third quickest. 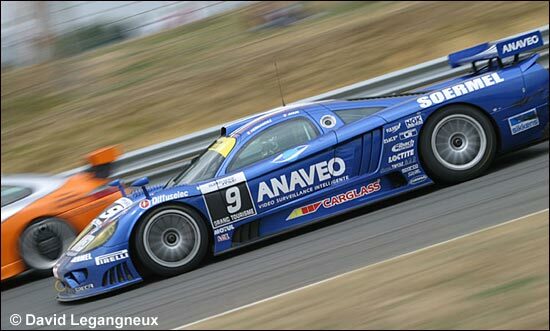 Bruno Hernandez (ANAVEO Oreca Saleen S7R), in the lead in the championship standings also sat on the second row, ahead of Gael Lesoudier (Mirabeau Viper) and Richard Balandras (Euroflash Autovitesse Viper). Pertti Kuismanen (#25 Corvette) started best and was first into turn one, ahead of poleman David Hallyday (#24 Corvette) but Hallyday put a lot of pressure on his teammate. The Soave / Cayrolle Corvette and one of the CD Sport Vipers went skating into the gravel at the first corner. Bornhauser (#1 VBM Viper), who had had an engine change, started from the pits and was moving up quickly into the field. On the third lap, Hallyday tried to pass Kuismanen, but there was a misunderstanding and contact was made. Kuismanen stopped on the track while Hallyday started again in third place, behind Lebon (#27 SRT Corvette) and Lesoudier (#10 Mirabeau Viper). Hallyday was really pushing hard and caught up with the two leaders and passed them two laps later. Then he widened a gap and set a strong pace. 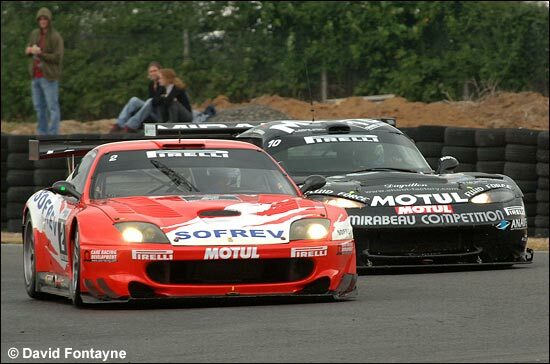 Behind Lebon and Lesoudier, the fight for fourth place was rife between Balandras (#11 Viper), Balthazard (#2 Larbre Ferrari 550), Hernandez (#9 Saleen S7R), Debard (#14 Tarrès Viper) and Fiat (#3 Protek Saleen S7R). 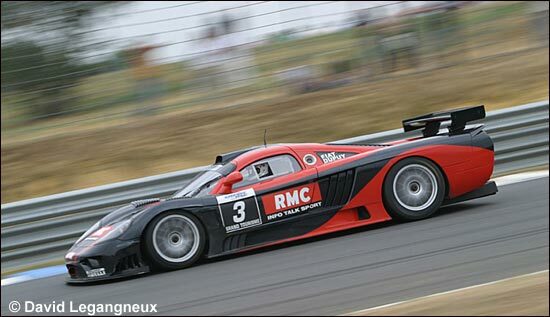 Before the driver changes, Hallyday had a twenty second lead. 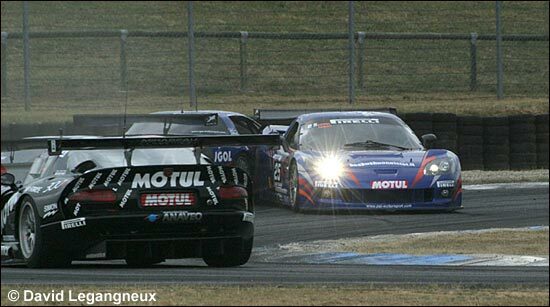 Alliot took over and was now ahead of Bouchut (#27 Corvette), Makowiecki (#10 Viper), Policand (#2 Ferrari), Ayari (#9 Saleen) and Dupuy (#3 Saleen). 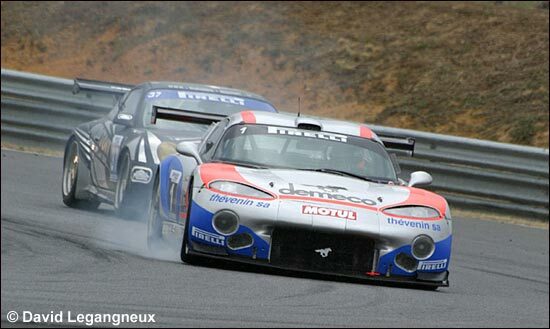 Positions were going to change….. Makowiecki (in the black Viper, following Polican's Ferrari 550, below) succeeded in passing Bouchut and Alliot had a spin owing to a stuck throttle. 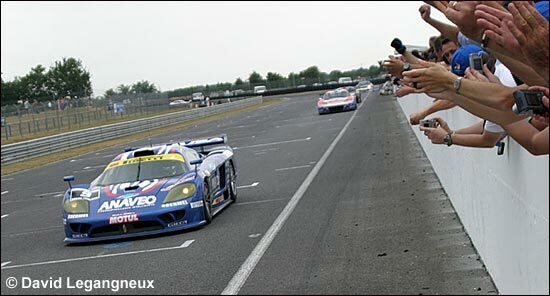 He started again, but in sixth place behind Policand, who had beeen overtaken by the Saleen. Suddenly, the leading car, Makowiecki at the wheel of the Viper, pitted for a drive through penalty, which in fact was for his team-mate Zangarelli. In the process, some rubber blocked the exhaust of the Viper, which caught fire – and was inevitably retired. Soheil Ayari then moved up a gear and passed Policand and Alliot, then Bouchut too. Bouchut could not do anything anymore against Dupuy either, so that made it a Saleen 1-2. 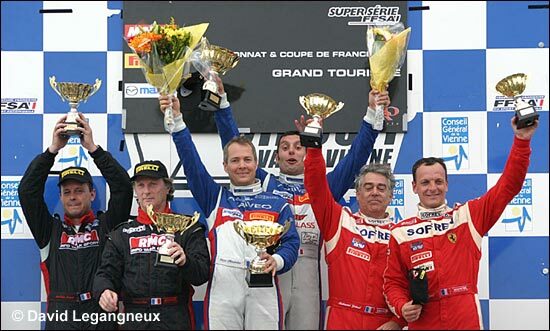 In the race for third place, Bouchut, Alliot and Policand came abreast onto the final straight and Policand crossed the line in third – but Alliot had annoyed Bouchut on that last lap, which provoked the younger Frenchman to set about his older rival in parc ferme. 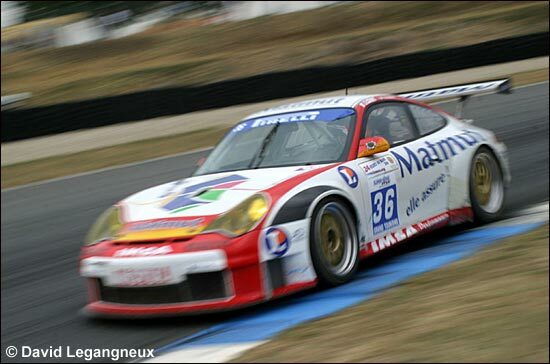 In the GT2 Trophy, the Monteiro brothers (Estoril Porsche 996 GT3 RSR) were leading in the early stages ahead of Pereira (Dodge Viper GT3) and Lecourt (IMSA Porsche 996 GT3 RSR) but after the driver change Raymond Narac (above) set a quick pace and was again the winner, ahead of the Monteiro brothers. With thanks to Frédéric Espinos and Olivier Loisy, with images by David Legangneux and David Fontayne.